After losing Puntland’s presidential election by a single parliamentary vote, incumbent president Abdirahman Mohamed Farole extended his congratulations to his opponent Abdiweli Mohamed Ali Gaas, a former prime minister of Somalia’s Transitional Federal Government (TFG). UN and EU envoys praised the autonomous state’s January 8 election, decided by the votes of 66 parliamentarians appointed by clan elders, as a model for Somalia-wide democratization. The maritime security community should also take note, as Ali Gaas, a U.S-trained economist, will preside over the original heartland of Somali piracy. One of the many issues facing the president-elect is what to do with the Puntland Maritime Police Force (PMPF)—a marine militia described by its supporters as Somalia’s most effective counter-piracy force and by its opponents as the Farole administration’s Praetorian Guard. 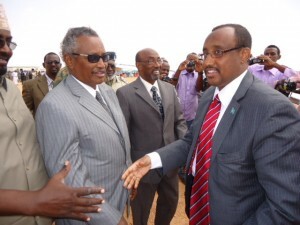 Puntland president Abdirahman Mohamed Farole (left) and president-elect Abdiweli Mohamed Ali Gaas (right). Farole came to power in 2009, a year in which Somali pirates attacked over 215 ships and operated with impunity from Puntland’s shores. The president’s answer was the PMPF, an elite coastal force that would deny the pirates their onshore sanctuary. The marines, trained by a South African private military company and financed by the United Arab Emirates (UAE), quickly grew to a force of 500 troops supported by a fleet of small ships, aircraft and armored vehicles. 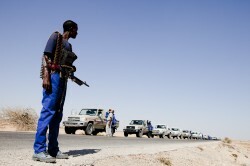 Security operations commenced in March 2012 and succeeded in disrupting pirate bases across the remote Bari and Bargaal regions. In late December 2012, the PMPF rescued 22 sailors held hostage aboard the MV Iceberg for almost three years. With Puntland-based piracy largely eliminated, the marines turned their attention towards encroaching al-Shabaab militants, using their expat-piloted helicopters to provide air support during several skirmishes in early 2013. While operationally successful, the PMPF was politically contentious. A January 2012 report from the UN Somalia and Eritrea Monitoring Group lambasted the marines “as an elite force outside any legal framework, engaged principally in internal security operations, and answerable only to the Puntland presidency.” Later that year, the president’s son Mohamed Farole became director of the PMPF, a cause of inter-governmental tension given his lack of military experience according to inside sources. On October 29 2012, the marines blockaded the residence of Ali Gaas in order to prevent him from campaigning among local politicians and clan elders. Ali Gaas pledged to improve Puntland’s security during his victory speech, but has yet to comment on his policy regarding the PMPF. Piracy may be suppressed, but many gangs are now diversifying into other illicit ventures such as arms smuggling and protection services for illegal fishing fleets. An al-Shabaab bombing against a PMPF convoy on December 5, 2013 further underscores the high level of insecurity that persists in the region. In the face of these challenges, what might the new president’s plans be for the contentious marine force? Despite the labeling of the Puntland marines as Farole’s “private army,” it is unlikely that Ali Gaas will dismantle the PMPF when he assumes office. It is expected, however, that the outgoing president’s son and other Farole loyalist will not retain their leadership positions (whether they help themselves to the PMPF’s valuable collection of equipment and vehicles on their way out is another question). Securing a steady source of funding to maintain the PMPF’s marines, bases, vehicles, and expat mentors will be a pressing concern for Ali Gaas. The bulk of current financing comes from UAE, but it remains to be seen if this arrangement will continue under a new president. There are indications that the former TFG prime minister envisioned the PMPF as a model of coastal security that could extend across Somalia. In April 2012, Ali Gaas’ office authorized Sterling Corporate Services to select and recruit soldiers from the Somali National Army to join the PMPF training camp in Bosaso, Puntland. The move was blocked by African Union (AMISOM) peacekeepers, however, which prevented the soldiers from embarking at Mogadishu airport. After the departure of Sterling in mid-2012, a US-registered security company, Bancroft, proposed a reversal of this plan, in which men and materials would be dispersed from the Bosaso base to a number of small coastguard cells across the Somali coast. This idea was rejected by the Farole administration, however, which was reportedly loath to cede control of its elite marine police force to the federal government. Relations between Puntland and Mogadishu continued to sour over the next year. In late July 2013, the new Somali Federal Government announced that it had signed a deal with Dutch private maritime security provider Atlantic Marine and Offshore Group to establish a coastguard to combat piracy and secure Somalia’s exclusive economic zone. The deal received a hostile response from Puntland officials, who saw the contract as an “unacceptable, inapplicable and unsuitable” violation of Puntland’s territorial sovereignty. In early August, the Farole administration suspended relations with the federal government. With a former TFG prime minister now coming to power in Puntland, observers anticipate a more conciliatory relationship between the state and federal governments. While a Somalia-wide coast guard or navy remains a distant prospect, the opportunity is now ripe for confidence building measures among local security forces. The PMPF maintains the most advanced training facility in the country and could once again offer to train marines from across Somalia if an acceptable deal can be worked out with the federal government and AMISOM. Supporting such an endeavor would be attractive option for the EU’s maritime security capacity-building mission (EUCAP NESTOR), which has thus far been unable to carry out its mandate in Somalia due to the country’s insecurity and fragile political arrangement. Puntland’s model of democracy is unorthodox by western standards and so too are its maritime police forces. Both, however, have demonstrated resiliency in the face of great challenges and may come to serve as templates for the rest of the country. As foreign warships and armed guards begin to depart the Horn of Africa, local marines will be the only thing standing between the pirates and their prey.